The Microfiber Convertible Rain Jacket is a do-it-all piece that''s perfect to keep in your golf bag at all times. This jacket features sleeves that zip off at the elbow, converting to a short sleeve jacket. Also featured with this waterproof jacket are taped seams, adjustable drawcord with stoppers at hem, two side pockets, elongated tail, comfortable elasticized cuffs and a chest pocket to keep your scorecard dry. What is the difference between a rain shirt and a rain jacket? 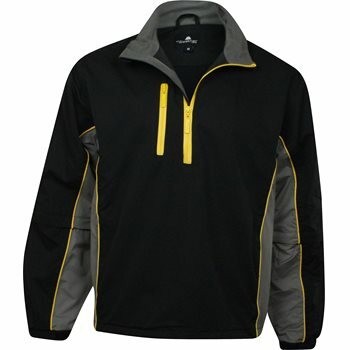 A rain shirt will typically have only a partial zipper in the front while a jacket will zip all the way down.